You can’t come to Ecuador without visiting the Amazon rainforest. I know, I know, there’s too much to see and not enough time. But the reality is that 1.5 acres of rainforest are destroyed every second. The Ecuadorian Amazon, specifically, is considered one of the most biodiverse areas on Earth, and its protection isn’t guaranteed. In fact, tourism may be one of the few reasons the rainforest hasn’t been completely destroyed at the hands of oil drilling and deforestation. So, you’re right, there isn’t enough time. Make your way to the Amazon rainforest before it no longer exists! 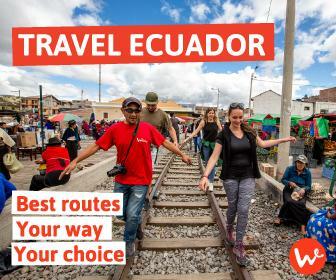 In the following blog, we’ll give you ideas on how you can combine a ride on the Wanderbus with your Ecuadorian Amazon tour. Ecuador contains a measly 2% of the entire Amazon rainforest, compared to Peru’s 16% and Brazil’s 60%. However, the Amazon is far more accessible in Ecuador due to its small size. In fact, you can reach the jungle in just a 3-4 hour drive from Quito! In the Amazon, you’ll find a host of options for your Ecuadorian Amazon tour. You might consider staying at a luxurious riverside lodge, or a more rustic community-run hostel. There are even luxurious riverboats that take you deep into the Amazon. To make the most of your time, we suggest visiting one of the cities at the foothills of the Andes that lead into the rainforest, like Baños. There are numerous lodges and activities you can visit in the area. Alternatively, you can use it as a jumping off point to go deeper into the Amazon. 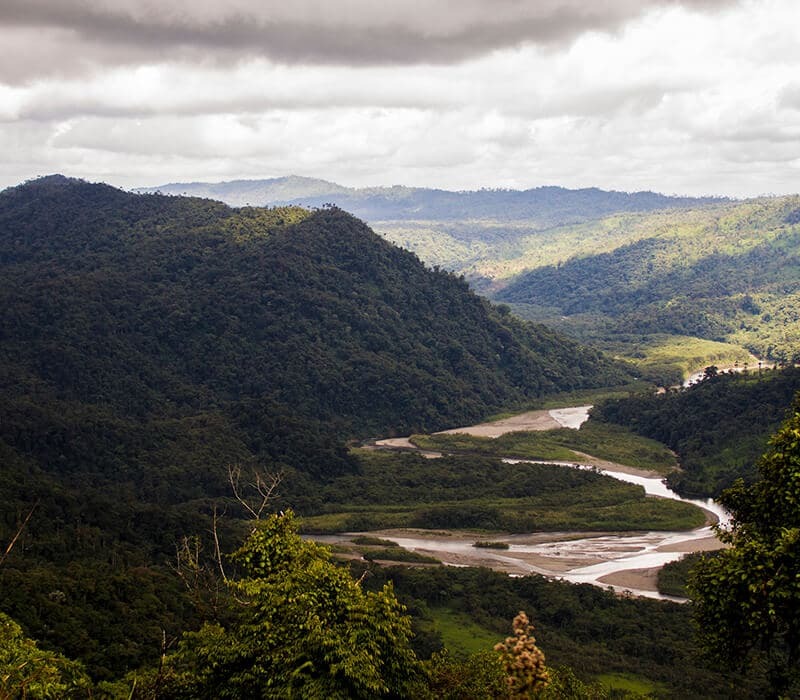 Within the Ecuadorian Amazon, the Yasuni National Park is considered a global biodiversity hotspot. Getting there isn’t easy, though, and may entail hours on a bus, then on a boat. Once there, you can choose from a number of ecotourism projects that offer accommodation and day tours. These projects are usually managed by indigenous groups who know the rainforest like the back of their hands and can spot wildlife from miles away. Read more about these projects in the following section, “world class Amazon lodges”. Baños is one of Ecuador’s top destinations. In fact, it’s second after Otavalo. And the Wanderbus takes you to both of these places. One of the reasons Baños is so popular is because of its location: it’s the gateway into the Amazon. It offers visitors many outdoor activities, a party scene and cool, humid weather. From Baños, it’s easy to plan your Ecuadorian Amazon tour, depending on your budget, time and interests. You can plan your Ecuadorian Amazon tour before you arrive in Baños, but you’re more likely to find the best prices if you visit a few agencies in town when you’re there. Alternatively, you can take the adventurous route and just travel farther into the Amazon to see what you find. 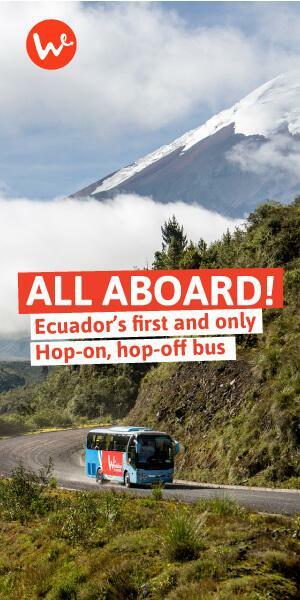 From Quito, just hop on the Wanderbus, hop off in Baños, embark on your Ecuadorian Amazon tour, and then hop back on in Baños to continue along your journey to Montañita or back towards Quito. Huella Verde Rainforest Lodge is located 55 minutes (by car) outside of Puyo, south towards Macas. Though still relatively close to some major cities, it feel extremely remote and is a wonderful place to reconnect with nature. The accommodations fit right into the surrounding forest and the menu is highly recommended. Only a 20 minute drive from Puyo, Bellandia offers guests another type of jungle experience. Its one-of-a-kind accommodations sets it apart from other lodges and its location offers a view of the protected Llanganates National Park. Daily activities include visits to nearby waterfalls and indigenous communities to learn about their culture (dance, handicrafts, food). Located about an hour and half drive from Puyo, toward Macas, Amunitai is another lodge worth visiting. It is situated beside the Amundalo River and all activities are included in the price of lodging. Activities include tubing, fishing, canoe rides and hikes. Located one hour from Puyo, Oro y Luna Lodge is an exceptional place to enjoy the tropical rainforest. It is located far from the noise and pollution of the cities, and the accommodations are basic, but comfortable and clean. This is especially nice for a couple that are seeking a romantic getaway. Activities available include: cycling, hiking, fishing. 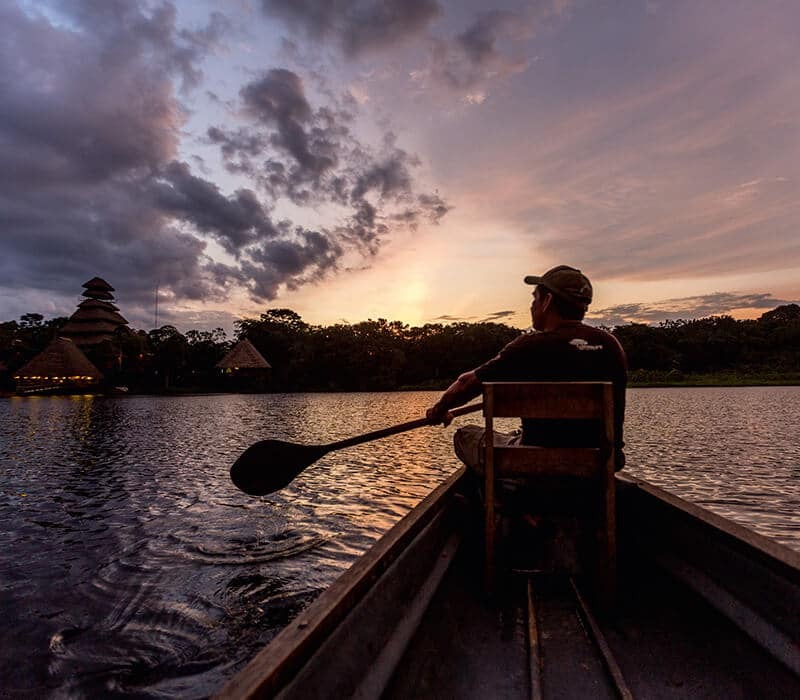 Though lodges may ensure comfort during your stay, there’s nothing like experiencing the real Amazon from the perspective of those that live there year-round. Indigenous communities, like the Huaorani, Shuar and Quechua, offer visitors basic accommodation along the tributaries of the Amazon. At these communities you can either camp or stay in basic huts and, during your stay, you’ll get an authentic glimpse into indigenous peoples’ everyday lives. 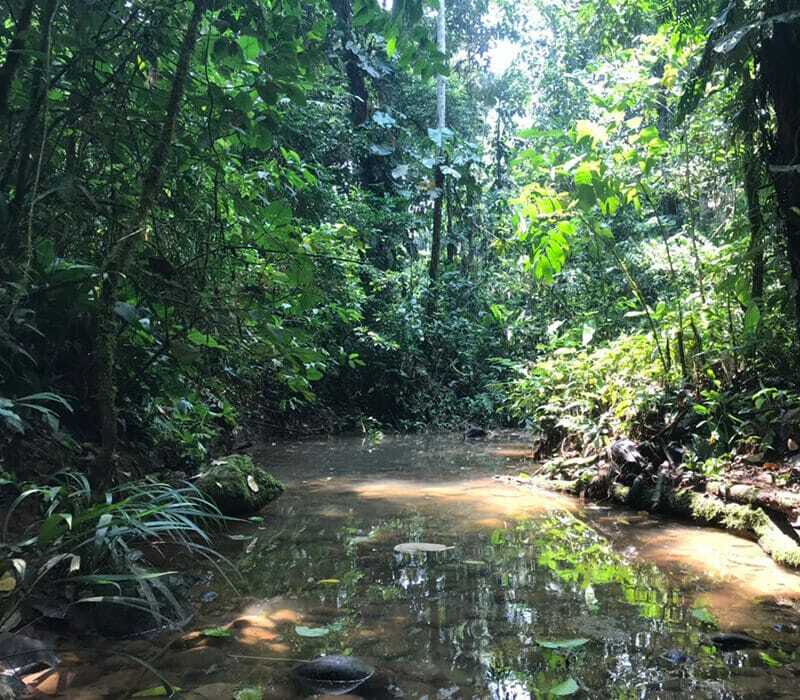 You’ll make new friends, head downriver in a hand built canoe, trek to hidden waterfalls and learn about the medicinal plants they use in the rainforest. You might even have the opportunity to try Ayahuasca, a powerful medicinal plant with many healing benefits. These community visits can be organized through a tour agency from Baños and Puyo, but they are much more affordable if approached directly. A number of these eco-tourism community projects can be found along the highway from Puyo to Macas. After leaving Puyo, you’ll pass a small town called Veracruz. Just another 20-minute drive past Veracruz, you’ll come across a few yellow speed bumps, see a large church on your left, and a road to the right advertising “Peces Gigantes” (gigantic fish) and a few ecotourism communities. Follow this road until you see a few more signs to the right with the names of a number of indigenous communities. If you visit these communities, keep in mind that a few dollars here goes a long way and they they might rely entirely on ecotourism to support their families. If you’re looking to head much deeper into the rainforest, here are a few world class lodges you should consider during your Ecuadorian amazon tour. Located deep in the Yasuni National Park, Napo Wildlife Center is 100% community-based and indigenous-run project. Its facilities are built on a the bank of large lake and day tours get you up close and personal with native wildlife. Activities include visits to the ecological tower, parrot clay licks, canopy tower, Kichwa communities, birdwatching, forest trails, and canoe rides. Kapawi is another community ecotourism project with the Achuar tribe. The Lodge offers 4-8 day travel itineraries and is more focused on exposing visitors to Achuar culture and traditions. At Kapawi, you can expect to see pink river dolphins as well as other jungle wildlife. La Selva Eco Lodge is an award-winning lodge in the Ecuadorian Amazon and one of the first of its kind. It is also located close to the Yasuni National Park, and offers guests a luxurious experience combining spa days with jungle adventure and wildlife observation. Built along the Napo River, Sacha Lodge is a breathtakingly beautiful place. Sacha Lodge has been around for over 20 years and has encouraged the protection of wildlife in the area and within its own private reserve. Chances of seeing rare and beautiful creatures are high. This is an all-inclusive experience and a wonderful option for families and small groups. The Amazon is a huge expanse of land and it’s difficult to tell you exactly when is the best time to visit. It is safe to say that in the rainforest, you should expect rain. How much rain is really the question! Broadly speaking, in Ecuador, the heavy rainy season takes place between December and June, through there’s a short dry season between January and March. There is a definite dry season between July and November. Don’t assume the dry season is the best time to visit the Amazon. Many birds and primates are more active during the rainy season. Generally speaking, wildlife is most easily spotted between November and March. Don’t put off your Ecuadorian Amazon tour any longer! If you’re already planning a trip to Ecuador, visiting the Amazon is extremely feasible, especially when combined with a Wanderbus pass that takes you to Baños, the gateway to the Amazon. In fact, one of the best parts about traveling to Ecuador is being able to visit the three different geographical regions in one trip: the Coast, Andes and Amazon. All of that is possible in one trip with the Wanderbus. Are you ready to embark on your Ecuador Amazon tour? If you feel like you need more guidance on where to go and what to do, feel free to contact us with more questions.